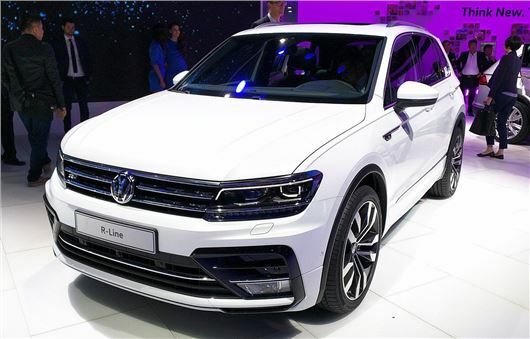 Volkswagen has premiered the all-new Tiguan at the Frankfurt Motor Show 2015. The compact SUV is 50kg lighter and 24 per cent more efficient than the model it replaces, with eight engines to choose from and the possibility of a plug-in hybrid powertrain being added in 2016. The new Volkswagen Tiguan will rival the Nissan Qashqai and should reach the UK before the end of 2015. It sits on a new longer wheelbase and gets a reworked exterior to bring it into line with the rest of the Volkswagen range, with a large three bar grille that's flanked by large, vertical headlights and expressive lines that sweep through to the rear. The amount of space offered in the cabin has taken a step forward with the larger wheelbase, with more head and legroom for those in the front and back. Boot space has also been increased to 615 litres with the rear seats in place and 1655 litres with them lowered, representing a gain of 145 litres. Power will come from a range of four-cylinder diesels - 1.6 and 2.0-litre - with outputs ranging from 115PS to 240PS. The Tiguan will be available in four models, spanning from the sporty R-Line to off-road focused versions, with Volkswagen’s 4Motion all-wheel drive. There’s also the possibility of a 218PS plug-in hybrid, with the Tiguan GTE Concept being unveiled at Frankfurt. The new Tiguan will be able to tow a caravan friendly 2500kg and feature a range of tech, with online notifications that will warn the driver about traffic delays, parking space availability and road works. Safety equipment will also be better, with automatic city braking, pedestrian monitoring, lane assist and post-collision braking all fitted as standard. In-car connectivity will also be improved, with Apple and Android functionality, via app connect that will also allow tablets to be paired up to the infotainment system.